Designed with aesthetics and functionality in mind, this rock-solid four poster bed is defined by its gentle and flowing lines. Crafted from solid wood by Amish woodcrafters right here in the United States, this solid wood bed is built to provide rest for generations. 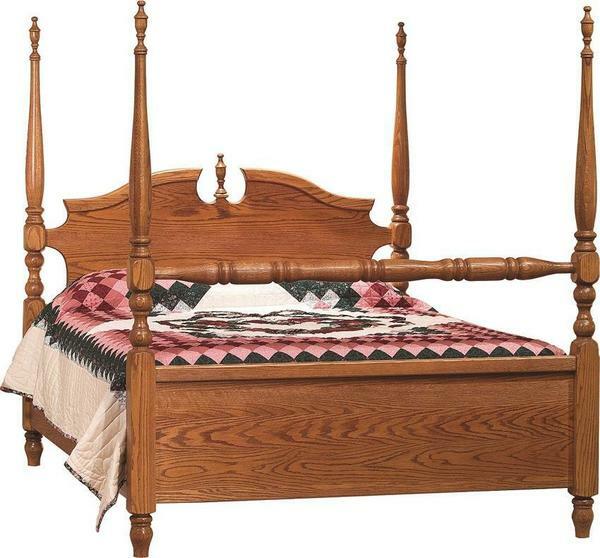 The Amish are known for building durable and beautiful products and this wooden bed is obviously no exception. This exquisite four poster bed is available in a variety of woods. The standard wood used in the construction of the wooden four poster bed is oak but you can also get it in cherry, quarter sawn white oak, hickory, brown maple, and rustic cherry. Each wood has its own selection of finishes available. From the drop-down list that contains the wood available, choose your wood, and the list of finish options should update. For example, if you choose cherry as your wood, the drop-down list displaying the finish options, should update, showing you the selection of finishes that go well with cherry wood.